This page outlines the parts needed for two different solar power systems to be used for full-time “off the grid” living in a moveable home: one for an RV and one for a sailboat. 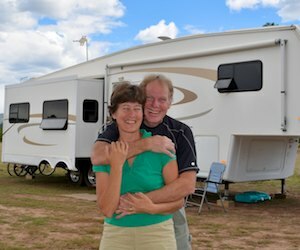 If you are going to live in your RV full-time, year-round, you will need a much bigger system than the one described on the previous page. You will likely be using your computer a lot, you’ll keep the lights on for many evening hours in the winter, you’ll be using the TV and stereo quite a bit, and you will want to use your microwave, hair dryer, vacuum and toaster on a regular basis. Compared to the small-medium sized systems described in our Solar Power Tutorial Part II, this will require more total wattage in the solar panels, a bigger and more sophisticated charge controller, more total amp-hours in the batteries and a better quality inverter that is wired into the RV’s AC wiring system. At the very least, a full-timer’s system should have 400 watts of solar panels, a 40 amp charge controller, 400 amp-hours of battery capacity and a 1000 watt inverter. The 12-volt 120- to 130-watt panels are sized about right to fit between the many little things that stick up on our fifth wheel’s roof. This system is rated to produce 600 watts at 12 volts and has a 440 amp-hour battery bank. It is a little bit larger than the system that we have on our fifth wheel trailer. Ae have three 120 watt panels and one 130 watt panel (for a total of 490 watts), and our system cost a whole lot more back in 2008! We can get as much as 170 amp-hours per day in summer, although more typically it is about 120 amp-hours. There have been summer days/nights when we watched our 26″ TV for 15 hours (the Olympics), and there have been days/nights when we ran two laptops for 10 hours and then watched a movie (such couch potatoes!!). In the dead of winter, around the winter Solstice (December 21), this system can produce about 80-100 amp-hours per day. The only limitation in winter is when storms cloud the skies for three or more consecutive days. Three cloudy winter days in a row where we get just 40-60 amp-hours makes us start thinking about supplemental charging or cutting back on our power use. Our weird choices for solar panel sizes were due to what we already owned from our first solar panel installation (a 130 watt panel) and what was available in the store at the time of purchase (120 watt panels). If we were buying today, we would have purchased four 150 watt panels as shown above. This system will allow you to run everything inside your rig but the air conditioner and big power tools. We have even used it to run a small compressor to change a flat tire on the rig (on four different occasions, ugh!). 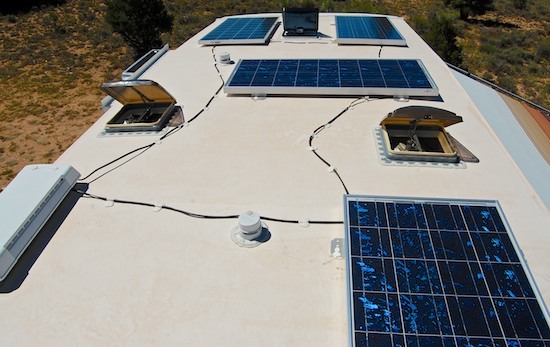 Installation follows the same guidelines as the smaller systems described in our Solar Power Tutorial Part II, but is just a little more complicated. An outline of the installation follows. Not many RV’s have enough battery boxes for four 6-volt batteries, especially trailers. Often the battery boxes are too short as well, since 6-volt batteries have the same footprint but are taller than the typical 12-volt Group 24 batteries that are shipped with RVs from the factory. Here are example 6 volt battery boxes and Group 24 12 volt battery boxes. If you haven’t purchased your RV yet, you may be able to get the manufacturer or dealer to modify the battery boxes for you as part of the deal (that’s what we did with NuWa on our fifth wheel). Wire two pairs of the batteries in series to form two 12-volt batteries, and wire those two pairs in parallel. Connect the wires that come from the solar panels to one side of the charge controller and wire the batteries to the other side. It is best to crimp eyes on the ends of the cables. Wiring the inverter to the AC wiring system in the RV is complex. The proper way to wire it is to place the inverter as close to the batteries as possible. 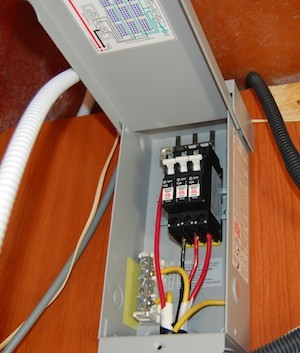 Protect the DC side with a big fuse, and wire it to a transfer switch. We are not master electricians, and we took a short cut on our system that not everyone would be comfortable with but that works very well for us. We positioned the inverter next to the DC to AC converter in the basement of the fifth wheel and wired it directly to the batteries. The converter is located next to an AC outlet that it uses for power to run (the converter uses the AC power to charge the batteries). When we use shore power, we plug the converter into the AC outlet to allow the converter to do its normal job of charging the batteries. However, we use shore power only a few nights a year, at most. When we dry camp, which we do virtually 100% of the time, we unplug the converter from the AC outlet so it is totally dormant and not in use, and then we plug the inverter into the AC outlet instead. The inverter and converter are never “on” at the same time. 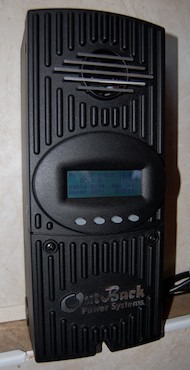 The inverter draws its power from the batteries and converts that DC power into AC power. That is, it generates AC power which it supplies to the rig backwards through the AC outlet it is plugged into. This is very non-standard and would be frowned upon by master electricians. What would concern them is that when the rig is in this configuration, the shore power outlet on the outside of the trailer is live, with power coming out. Accidentally plugging the shore power cable into the shore power outlet on the outside of the RV while the inverter is turned on would be disastrous. However, because we almost never use our shore power cable and we rarely change our setup to switch between dry camping and hooking up (since we dry camp almost exclusively), this method has worked fine for us for over seven years. This is not a recommended strategy if you plan to switch between dry camping and using electrical hookups frequently. We also connect the two 50 amp AC legs of our 50 amp coach by plugging a modified extension cord with a male connector on each end into one outlet on each leg. We have two outlets next to each other in the bedroom, one on each of the 50 amp legs in the trailer, that are ideal for this purpose. We plug the “cheater” cord into each outlet, effectively connecting the two 50 amp halves of the RV together at that point. It is handy to wire the inverter to a simple toggle switch located somewhere inside the RV so you can turn the inverter on and off from inside the rig without having to go outside to the battery compartment each time you want to turn on your AC power. A large arch installed off the back end makes it possible to use very big panels. Note the shade on the panels from the mast and shrouds. The panels are producing about 50% of their potential power right now! A system like the above would work fine on a sailboat. However, another style of design — which we ended up using — is the following. Of course, this system could be used on an RV as well. This system is rated to produce 750 watts at 24 volts and has a 650 amp-hour battery bank. One basic difference between the sailboat design and the RV design is the use of AGM batteries rather than wet cell batteries. AGM batteries are not only maintenance free but they can be operated while lying on their sides, whereas wet cells prefer to be upright. They also charge up faster and discharge more slowly. There is less need for expensive AGM batteries in an RV than on a sailboat since an RV never lies on its side the way a sailboat does while sailing. However, that said, gazillions of cruising boats have sailed around the world with wet cell batteries, through all kinds of storms and mayhem, with no problem, so AGM batteries are by no means required on sailboats. On the other hand, if you have the money and don’t want to be hassled with battery maintenance on your RV, go for AGM instead of wet cell! The primary difference between the two systems is the size of the solar panels. An RV has things sticking out of the roof that may hamper the installation of very big solar panels (hatches, fridge vents, air conditioning units, TV antenna, domes, etc.). So the slightly smaller 150 watt panels may be easier to position on the roof than the big 250 watt panels. Going even smaller (120 watt or 100 watt) may be advantageous. Finding a place for solar panels on a sailboat is challenging, but the best solution is often to build an arch over the back of the boat, as far behind the end of the boom as possible. This arch can be designed to support large panels. See our Sailboat Solar page for more details about our arch and panel installation. If you are a west coast sailor, consider going to Baja Naval in Ensenada, Mexico, and having Alejandro Ulloa install your arch. His stainless steel fabrication is by far the highest quality and most beautiful we have seen in all of the US West Coast and Mexico. 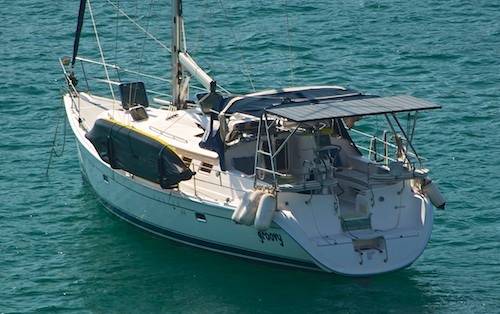 This sailboat system differs slightly from the first RV system shown above in that rather than being a strictly 12-volt system, one part of the circuitry is 24-volt (the portion between the panels and the charge controller), and one part of the circuitry is 12-volt (the portion between the charge controller and the batteries). The combiner box contains a breaker for each panel and combines the 3 wires from the panels into 1 for the charge controller. The charge controller steps down the voltage from 24-volt to 12-volt (and correspondingly doubles the current). Large panels aren’t available in 12-volt configurations. Also, the wiring for 24-volt panels can be slightly thinner gauge, which is advantageous (discussed in more detail on the next page of this tutorial). The other difference is that this system uses a combiner box and circuit breakers. This makes for a more professional installation and can be used on any/all solar power installations that use more than one panel in parallel. The combiner box sits between the panels and the charge controller. One of its purposes is to combine the three wires coming from the three panels into one wire that goes to the charge controller. The other purpose is to provide a breaker for each solar panel so that if something goes wrong the panel can be shut down easily or will trip the breaker automatically. Installation of a solar power system on a sailboat is more complicated that on an RV simply because the panels are flying out there on some crazy scaffolding in the sky and the batteries are scattered about the bilge of the boat somewhere. The solar panels and batteries are often separated from each other by a big distance. Finding space for batteries, installing them so they will stay in place even if the boat flips upside down, and snaking wires down the inside of stainless steel tubing in an arch is not all that easy. The system outlined here is basically the system we have on our sailboat, except we have three 185 watt panels instead of three 250 watt panels (we weren’t sure if the bigger panels would be physically too big. In hindsight they would have probably fit fine). We have anchored out over 750 nights, usually for months at a time. In a typical day we use two laptop computers for about 4-8 hours and watch a movie on our 22″ TV/DVD (with power hogging sub-woofer & surround-sound) at night. We get about 220 amp-hours (at 12 volts) per day in the summertime and about 165 amp-hours per day in the wintertime, provided the panels are unshaded all day. We have found that the winter prevailing winds on the Pacific Mexican coast usually position the boat so the mast shades the panels for a few hours each afternoon, dropping our typical daily total to 150 amp-hours. We have found that if we run both our DC refrigerator and our separate DC freezer (both of which both cycle on and off 24/7 — a very different load than a few hours of continuous computer or TV use — we come up a little short charging the batteries each day in winter. However, if we turn off the freezer (which uses about 50-70 amp-hours every 24 hours all by itself! ), our batteries are fully charged and in “float” mode by mid-afternoon each day throughout the winter. So — provided we can live without frozen meat and ice cubes (gasp!) — we can sit at anchor indefinitely without ever going into a marina or running the engine for supplemental charging from the alternator. This is a good thing, because our fancy Balmar smart charger/alternator combo gave up the ghost in Huatulco, and we waited eight weeks at anchor for a replacement to come down with a friend from the US. We don’t have any kind of generator on the boat. Most of the components for an RV or marine solar power installation can be purchased at Amazon. Purchases at any of our Amazon links help cover our out-of-pocket costs for operating this site -- thanks! This entry was posted in Solar and tagged New, Non-Travel, Popular Articles, RV Solar, RV Technical Topics, Solar-Tutorial by Roads Less Traveled. Bookmark the permalink. i have 200 watt panels.200 Ah AGM batteries . my load is a 120 W 12 volt pump on 8 hrs (16.00to24:00 hrs) per day, Yet my MPPT controller (chinese)is not getting me enough charge to run pumps for more than 3 hrs per day.. Where am I short? You are looking for 96 amp-hours per day. In our experience, you’ll need 400 watts of solar panels to get that. The motor home I am ordering will come with 4-235 amp batteries. If I want solar panels to cover daily use I figure I would need 960 or more from panels. That should be large enough, will be hard to get other half to cut down on power usage. RV comes with a 20 cu ft residential fridge. Will my set up as figured cover that? Your fridge will probably use 75 ah per day. Unclear if your batteries are 6 volt or 12, so you may have 470 ah of batteries (if 6 volt) or 940 ah (if 12 volt). You will probably need at least 400 ah of batteries and 400 watts of solar to run your fridge alone most days (you’ll need more in winter). Then add in your other usage, probably another 100 ah per day. That means 1200 ah of batteries and 1200+ watts of solar. You can’t have too much, so I’d get the biggest of everything you can fit in your basement and on your roof. If it were me and I were starting from scratch like you with a brand new motorhome and I were going to boondock for much of the winter, I’d get 1500 ah of batteries and 2000 watts of solar. You can get by with less if boondocking less and predominantly in the summer. I was wondering, how much weight does this add to the unit using the full-time system that you describe in the beginning of this article? The carrying capacity of the unit we are looking at is about 2500 lbs…. It might add around 400 lbs. all together if you replace the unit’s batteries with four 6-volt golf cart batteries. The batteries are about 65 lbs. each and the solar panels are about 25 lbs. each.